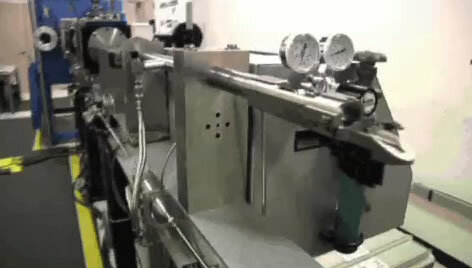 The addition of minute amounts of long, flexible polymers to a liquid causes substantial turbulent drag reduction. For low enough flow rates and high enough fluid elasticity, the flow transitions to a chaotic state dubbed elastoinertial turbulence (EIT) featuring structures that are very different from those in Newtonian turbulence, most notably highly-localized ‘sheets’ of strong polymer stress fluctuations. Surprisingly, these flow patterns bear striking resemblance to critical-layer structures, i.e., structures localized at the wall-normal location where the disturbance propagation speed equals the background flow velocity, arising from the viscoelastic extension of classical Tollmien-Schlichting waves, which are closely related to the most-amplified 2D disturbances to the laminar state. This suggests the sheet-like structures that are the hallmark of EIT have their origin in similar mechanisms. Ashwin Shekar, Ryan M McMullen, Sung-Ning Wang, Beverley J McKeon, and Michael D Graham. “Critical-Layer Structures and Mechanisms in Elastoinertial Turbulence". Physical Review Letters. 122, 124503 (2019). Figure caption: (a) DNS snapshot, (b) phase-averaged Fourier transform of DNS, (c) Tollmien-Schlichting wave, (d) most-amplified 2D disturbance. In all panels line contours are wall-normal velocity, filled contours are streamwise polymer stretching. Spring-actuated autoinjectors delivering viscous drug solutions resulting from large drug concentrations require large spring forces which can create high peak pressures and stresses within syringes. The high peak pressures and stresses can lead to device failure. 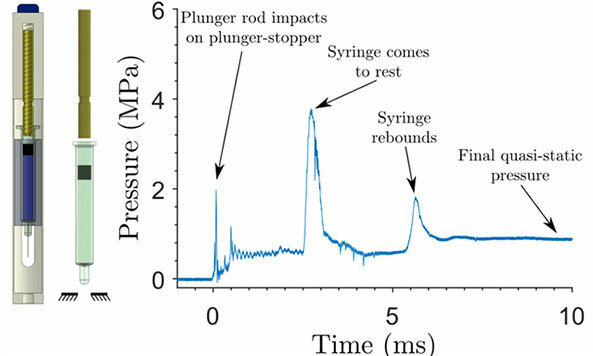 Measurements with a suite of novel instrumentation and analysis using numerical simulation explain the peak pressures and peak stresses as originating from mechanical impacts between moving components, the large acceleration of the components, and surprisingly, the production of tension waves in the liquid resulting in cavitation. In a recent paper Symon et al, Expts. in Fluids, 58(5) 2017, Professor McKeon and colleagues provided an experimental demonstration of the assimilation of experimental mean velocity data to estimate turbulent stresses in the flow over an idealized airfoil. The attached figure shows a comparison of model forcing from (noisy) experiment on the left and the assimilated (clean) estimate on the right. The study highlights the utility of combining even relatively poorly-resolved and noisy experimental data with a model that obeys the governing equations in order to obtain information that either was not or could not be directly measured. A recent research interest for Professor Rosakis is Hypervelocity Impact. Hypervelocity impact is a rising concern in spacecraft missions where man-made debris in low Earth orbit (LEO) and meteoroids are capable of compromising or depleting the structural integrity of spacecraft. To address these concerns, the goal of current research is to experimentally investigate the underlying mechanisms responsible for deformation and damage evolution during hypervelocity impact utilizing Caltech/JPL's Small Particle Hypervelocity Impact Range (SPHIR) facility. By combining high speed photography, optical techniques, including Coherent Gradient Sensing (CGS) interferometry, the dynamic perforation behavior involving crater morphology, debris and ejecta formation and solid/fluid/plasma transitions and interactions have been examined. Click image to view video. The aims of this project are to develop a quantitative framework for investigating and characterizing the geometry of "eddies" in turbulent flows. This is done by the numerical simulation of turbulent fluid flows from which both Eulerian (time instantaneous) and Lagrangian (time evolving) three-dimensional fields can be extracted. Quantitative tools such as the curvelet transform can then be applied to extracted fields to produce a multi-scale decomposition from which the statistical geometry of turbulent eddy structure over various length scales can be studied. 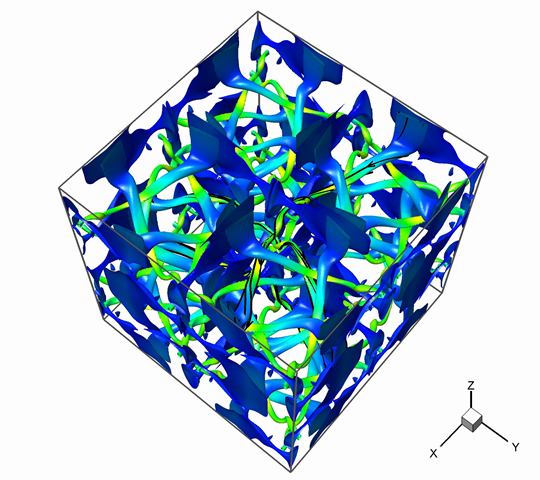 The results of the research can provide support for structure-based models of turbulent flows. Image of vortex iso-surfaces in a viscous flow starting from Taylor-Green initial conditions. The vorticity vector is everywhere tangent to these iso-surfaces which are extracted from a continuous vortex-surface field. Some sample vortex lines are shown. The vortex surfaces, colored by vorticity intensity (yellow highest), depict a tangle of vorticity tubes and vorticity sheets. A broad range of experimental and theoretical research efforts seek to exploit the directional amplification associated with the Navier-Stokes equations to illuminate the dominant mechanisms behind observed flow physics in wall turbulence. A particular topic of interest is the exploitation of flow receptivity to stochastic or optimized small disturbances to reconcile the statistical and structural pictures of wall turbulence and expand current modeling capabilities. The modeling framework of McKeon & Sharma (J. Fluid Mech., 2010) can be used to predict hairpin vortex structure in turbulent pipe flow identified by isocontours of swirl, the imaginary part of the complex eigenvalues of the velocity gradient. The shape of the streamwise velocity mode associated with near-wall turbulence activity: prediction from the model of McKeon & Sharma (J. Fluid Mech., 2010). Red and blue isocontours represent positive and negative velocity fluctuations relative to the mean velocity. In the late eighties, Rosakis introduced the concept of "Laboratory Earthquakes" and since then his research interests have mainly focused on the mechanics of seismology, the physics of dynamic shear rupture and frictional sliding and on laboratory seismology. The goal of this body of work is to create, in a controlled and repeatable environment, surrogate laboratory earthquake scenarios mimicking various dynamic shear rupture process occurring in natural earthquake events. Such, highly instrumented, experiments are used to observe new physical phenomena and to also create benchmark comparisons with existing analysis and field observations. The experiments use high-speed photography, full-field photoelasticity, and laser velocimetry as diagnostics. The fault systems are simulated using two photoelastic plates held together in frictional contact. The far field tectonic loading is simulated by pre-compression while the triggering of dynamic rupture (spontaneous nucleation) is achieved by suddenly dropping the normal stress in a small region along the interface. The frictional interface (fault) forms various angles with the compression axis to provide the shear driving force necessary for continued rupturing. Rosakis and his co-workers, investigate the characteristics of rupture, such as rupture speed, rupture mode, associated ground motion under various conditions such as tectonic load, interface complexity and roughness. Both homogeneous and bimaterial interfaces (abutted by various elastic and damaged media) are investigated. Rosakis and his coworkers have been credited with the experimental discovery of the "intersonic" or "supershear rupture" phenomenon. Indeed they have investigated this new phenomenon in various engineering and geophysical settings involving shear dominated rupture in the presence of weak interfaces or faults. Their experimental discoveries of supershear rupture has refocused the attention of the geophysics community to the study of supershear earthquakes. The fastest super-shear cracks on Earth: Bimaterial delamination; shear rupture of a graphite composite; and rupture of a frictional interface simulating a laboratory earthquake. The calculation of strong waves in condensed media remains a challenge. The prevasiling approach use a Lagrangian formulation which follows material particles. We are examine the use of Eulerian approaches where the mesh is fixed and the material flows through the mesh. Our approach is based on m odern shock capturing techniques that have been very successfully used for gas dynamics but that have not received much attention for solid materials. The benefit of an Eulerian approach is better resolution of vortical type flows which mix multiple materials as well as the ability to experiment with subgrid scale methods to resolve complex phenomena that cannot be captured at the smallest length scale available to the computation. We are also interested in the proper modeling of dissipation for solid (as well as fluid) materials as it is known that current approaches which use numerical dissipation can sometimes create artificial physical response in the materials under study. We also make use of computational techniques such as adaptive mesh refinement and parallel computation to resolve to the fullest extent possible the relevant phenomena. Mach reflection of a strong shock wave propagating in Aluminum against a rigid inclined ramp. 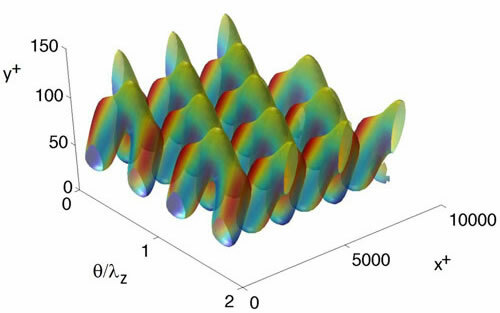 Wave propagation in shocked solids is more complex than in fluids. In particular, an incoming shock wave can bifurcate into an elastic prescusor and a trailing wave associated with plastic work. Shown on the left of the figure are the contours of density indicating the compression of the material. The two shock waves (elastic and plastic) are clearly seen in addition to the reflected waves which must appear when a shock interacts with an oblique boundary (known as Mach reflection). 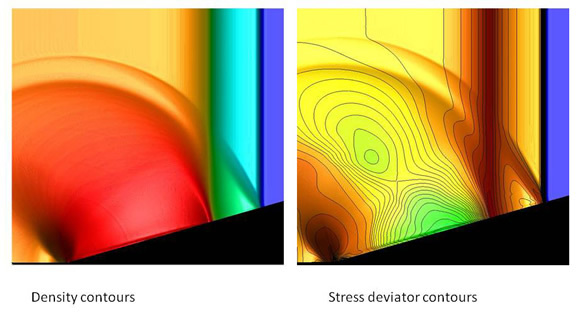 The right figure shows the stress deviator contours which indicate the material strength response of the solid material. These calculations are performed using a new fully Eulerian formulation of solid mechanics which is able to deal with strong shocks and the complex waves that arise as a result of shock boundary interactions. Joint work of Dale Pullin and Dan Meiron. Bifurcation of reflected shock waves is often discussed as it pertains to shock tube performance. The related problem of detonation reflection is currently being studied in the Explosion Dynamics Laboratory under Prof. Joseph Shepherd. Shown are two schlieren images in very similar mixtures at identical initial pressure. The detonation case (left) is 90% nitrous oxide with 10% hydrogen to give detonation whereas the shockwave case (right) is 100% nitrous oxide. In both cases the Mach number of the reflected wave is 1.6, but the reflected shock wave has stronger interaction with the boundary layer than the reflected detonation wave. Preliminary results suggest this is due to the importance of the thermal boundary layer behind the detonation. The fluid dynamics of detonation reflection (left) are drastically different from shock wave reflection (right) for similar initial mixtures and reflected mach numbers. This research seeks to couple small amplitude, time-dependent perturbations to surface morphology with the controlled response of fluid systems ranging from turbulent boundary layers to bluff body separating flows. As such, experimental and analytical research is under way into both fluid response and the fabrication of smart, morphing surfaces. Objectives include drag reduction and force vector control via the implementation of closed-loop control of high Reynolds number, non-canonical and applied wall-bounded flows using bulk actuation of discrete surface regions, with the potential for a significant contribution to future aerospace design methodologies and vehicle efficiency. Wall turbulence at high Reynolds numbers is a problem of extensive practical interest, but even the canonical configurations have continued to confound the accumulated wisdom acquired over the last half-century. There is a need for detailed measurements at high Reynolds number and further study of the new measurement issues that arise under these conditions. Ongoing experimental work involves laboratory and field campaigns designed to give insight into flows of practical interest, including the rough wall regime. 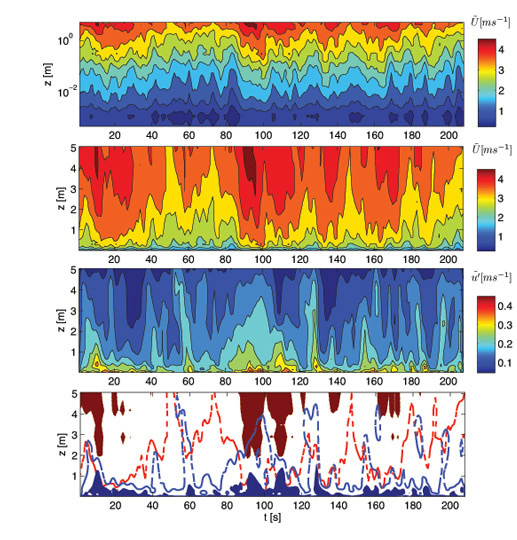 Reconstructed temporal variation of the streamwise velocity in the near-wall region of the atmospheric surface layer under near thermally neutral conditions. From top to bottom: sliding window mean (logarithmic and linear scales); sliding window root mean square fluctuations; overlay of select contours showing the complex interaction between large and small scale turbulent activity. Measurements were obtained using 31 single normal hot-wires over the first five meters of the layer (Guala, Holmes & McKeon, J. Fluid Mech., 2011). Swimming animals propel themselves by shedding vortex wakes which range in complexity from the isolated vortex rings of jetting swimmers (such as squid or jellyfish), to the chains of vortex rings formed by most fish. In order to evaluate the performance of these swimmers, we must assess the optimality of the vortex wakes they produce, which requires an understanding of their stability. In this project, we consider simple models for the vortex rings produced by swimming animals, and study their stability under perturbations of the type that might occur during the vortex formation process. The wake of a simulated eel. The chains of vortex rings which form in the wake of a swimming eel are revealed by the forward-time Lagrangian coherent structures (LCS), shown in blue. LCS act as separatrices between regions of different flow kinematics, in this case dividing the eel's vortex wake and the surrounding fluid.